I have been watching a harvester ant mound from afar. It is located just on the boundary between my lawn and my scrub. They have been living there for years, happily going about their daily chores. Harvester ants collect bits of charcoal, wood, and seed husks and arrange them around the entrance to their mound. No one is sure why they do this. I am not watching them to figure out their unusual predilection. I’m hoping to witness the weird behavior of ‘anting.’ Certain birds, usually large woodpeckers or crows, will land near an ant mound, particularly those mounds of larger-sized ants such as the harvester. The woodpecker will then start collecting ants not to eat but to stuff the squirming insect deep into its own plumage. Ant after ant gets stuffed in. It is thought that the irritated ants spray formic acid thus fumigating the bird against lice and feather mites. The behavior reminds me of a reef grouper pulling up to a coral and allowing a cleaner wrasse to groom him. The difference here is that the ants are unwilling participants in the whole endeavor. Anyway, I’ve never seen anting and I’m determined. I imagine the birds need to feel safe before they will let down their guard and approach a mound. This mound seems perfect: close to cover, quiet, overrun with ants. So I wait. Days, months, years go by. I refer to it as ‘my scrub’ and I legally own this small patch of it. I can plow it under and destroy it if I wish. But in fact, the scrub possesses me. I am its pet, its chotski, its gee-gaw. I have to conform to its moods and foibles. It forces me to watch as it inches upward, expands into the lawn, blows over in a hurricane, burns in fire. I am consumed by what it will show me next. Anting. A tiny relic plant. Some unknown fossorial delight. Waiting for a specific thing to happen can be frustrating. But waiting also can teach you things you didn’t even know to ask about. There are actually several kinds of scrub in Florida. Coastal scrub occurs along barrier islands. They distinguish themselves from other scrubs by being salt spray tolerant. Rosemary scrubs are dominated by (surprise!) rosemary. They are the most ‘beachlike’ of the inland scrubs with a lot of open sandy areas. Rosemary scrubs are very rare and are often just small patches within larger scrubs. The famous Archbold Station is a rosemary scrub. My scrub is a sand pine scrub. The botanical foundation of sand pine scrub is constructed of oaks, pines, palmettos, and grasses. Scrubs are deluged with rain in the wet season but even then the sand and hot temperatures dry up the ground quickly. During the dry season the lack of moisture is compounded. On top of that, scrub is a land forged by fire. Regular burnings favor certain reproductive strategies; seeds that lay in wait under the sand, thick barks, deep enormous roots, clonal colonies, cones that are opened by the licking of flames. There are two pines, slash and sand. Slash pine (Pinus elliotti) is the taller and thicker of the two. This longleaf pine has stiff needles in bundles of three. The thick flakey bark, when opened like a book, often exposes small millipedes, beetles, ants, and pseudoscorpions. The columnar truck rises straight out of the sand and soars to the sky. As it grows, the older, lower branches invariably drop off giving slashes their distinct columnar look. Slash pines are favored by lightning and, as they mature, some meteorological event will usually snap off the leader. The pine’s crown responds by growing horizontal forming the classic thundercloud shape. The sand beneath the slash pine is littered with large cones, long orange needles, and thousands of thin rectangular sheaths of bark. The sand pines (Pinus clausa), historically known as Florida spruce, are more fragile than slash pines, have a fuller profile, and softer, shorter needles in bundles of two. Here in the scrub, there are many more sand pines than slash pines. Sand pines are the only overstory tree here. They can grow quite tall and thick, but never achieve the thundercloud look of the mature slash pines. They tend to hang onto their older branches longer than slash pines and have many dead branches. Sand pines are shaped by hurricanes. Most of the older sand pines are severely leaning, usually en masse, in the direction of the last hurricane winds. Their entangled roots help keep them from falling completely over and dying. The leaning trees and dead branches gives the sand pine scrub an untidy look to those among us who prefer strictly vertical trees. Palmettos are ecosystems in themselves providing shelter under their stacks of dried fronds and food in the form of fragrant nectar and plump fruits. No self-respecting Florida habitat is complete without their persistent alligator-backed trunks twisting out of the ground. Palmettos are the soft mast of the forest, forming with acorns the nutritional centerpiece for scrub gourmands. Scrub oaks include Chapman’s (Quercus chapmanii), myrtle (Q. myrtifolia), inopina (Q. inopina), and scrub live oak (Q. geminata.) Inopina is Florida’s only endemic oak. 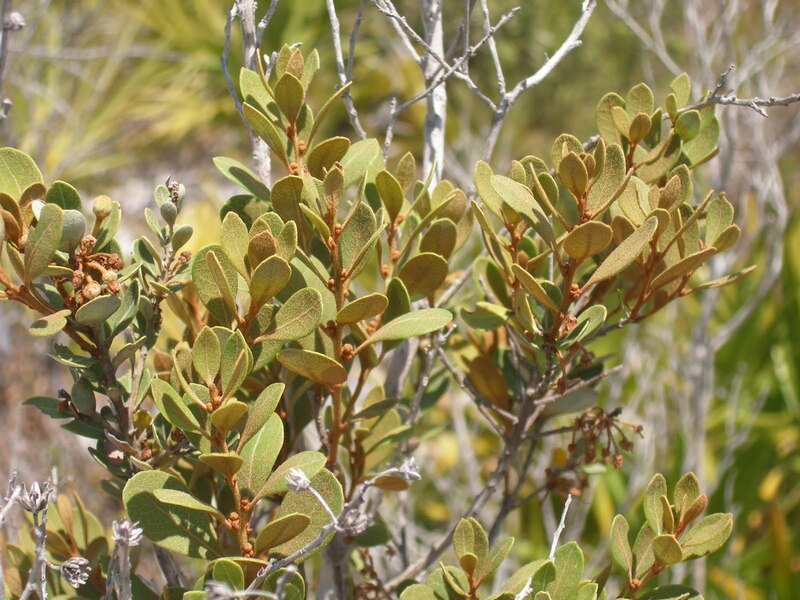 All are evergreen and tend to dwarfism in the infertile scrub sand. Turkey oaks (Quercus laevis) are traditionally deciduous and have a knack for growing taller then the scrub oaks. The acorns of all oaks are critical hard mast food for countless animals. Often over-looked but equally indicative of scrubs are the lesser-known pawpaws (Asimina), the bays (Persea), and the heaths (Ericacaea). The heaths in general are widespread worldwide and include the blueberries, lyonias, and cranberries. Lyonias are present in all scrubs and are often over-looked because their foliage somewhat resembles the evergreen oaks. The three lyonia sisters are staggerbush, rusty, and fetterbush. During the cooler winter months, every bee dreams about the blooming of the lyonias. Staggerbush (Lyonia fruticosa) is the first of the lyonias to bloom in late winter. The smaller twigs are crowded with countless fragrant, white, waxy bells that hang downward and have charming upturned lips. Carpenter bees, bumblebees, hundreds of wasps, and solitary bees flock to the tiny blooms. The undersides of staggerbush leaves are gray and moldy looking, like the rind of a fine cheese. The leaf edges are slightly curled under. In the late summer, you may find huge fleshy ear-like growths on the staggerbush leaves called galls. Related to the more familiar oak galls, these are the grotesque nurseries of gall wasps. Gall wasps trick the staggerbush by injecting a bit of plant hormone into the spot the wasp wants a nursery. Other species of wasps must collect mud, or chew cellulose into paper, or dig holes. But the gall wasp is a mad scientist and an alchemist, not an architect. It learned how to produce very specific hormones used by trees to control growth, leaf spacing, and branching. The wasp injects a bit of the appropriate hormone into the tree and the staggerbush grows the gall for the wasp. The young wasp matures inside its living gall nursery until exiting as an adult through a chewed pinhole. Rusty lyonia, or crookedwood, (Lyonia ferruginea) is an easily recognizable tree. The trunk and branches all grow in a twisting, erratic way, up to 20 feet tall. The bark is shredible and corky, like thick cedar bark. Leaves curl down at the edges and the lower surfaces and stems are covered with a reddish pubescence. The leaves flush out beautifully in the same rusty color, offsetting dramatically in the greener mature foliage. Crookedwood prefers the acidic soils that accompany piney forests, so it is very common in my sand pine scrub. Often confused with the oaks, the easiest distinguishing mark is that most oaks here have distinctive red lichens blooming on their trunks. Lyonias have no red lichens unless the tree is very old. Crookedwood blooms in April, soon after staggerbush has spent its last flower. The bees happily transfer their attentions to the more fragrant crookedwood. The bell flowers are clustered on every twig like a living carillon. They smell like violas in the air, soft as a pony’s nose. Carpenter bees employ several techniques while negotiating the flimsy flower sprays. The limp stems are too weak to land on, so the bees noisily hang upside down or pull the flowers upwards like a cup as they sit on the twig above. It takes young bees several tries before they solve this puzzle, but they are quite good at figuring out flowers. All of this activity and noise adds to the carnival atmosphere during the lyonia bloom. Walking through the gracefully curving archways and twisting collonades of a mature crookedwood forest in the spring makes for a lovely afternoon. The fellow down the road that sells frog legs also cuts down rusty lyonia trees to use their attractive trunks and branches as decorative artificial trees. You can probably find rusty lyonia trunks with plastic stems and leaves glued on them at a home décor store near you. Fetterbush (Lyonia lucida) is the prettiest of all the lyonias. The blooms are an elongated fairy bell shape and are bright pink, often red, in color. Fetterbush is much more shrubby than either of the other two lyonias and when they are not blooming, you are unlikely to notice them. In highly competitive and ideal conditions, I’ve seen fetterbush grow into small 12 foot trees. Fetterbush aggressively colonizes newly cleared areas, often filling every available spot with its bright green, flat oval leaves. The leaves bear no resemblance to the other lyonias because of the color, the thick, uncurled edges, and lack of pubescence. Leafcutter bees are particular fond of fetterbush leaves and most of the older shrubs have the unique semi-circular cutouts that are the leafcutter’s calling card. The bees shape their cut-outs into Dixie cups that they will fill with pollen and a single egg. Then they will stack the filled cups into a tree crevice or burrow. Each bee larva has its own personal cup, filled to the brim with pollen. Fetterbush is also a favorite food of the muskmare, a locally abundant walkingstick. During the day, muskmares congregate in the pleats of palmetto fronds. At night they disperse into the oaks and lyonias to feed. 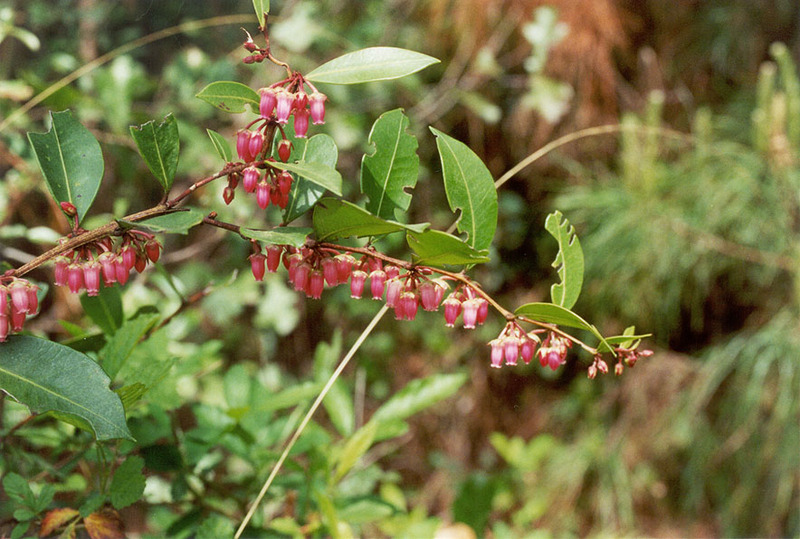 Shiny blueberry (Vaccinium myrsinites) is another heath that is very common in scrubs. Tiny, smooth leaves cover this ungainly knee-high shrub. Shiny blueberry is very stubborn and achieves the status of a weed in the garden. The flower bells differ from the lyonias by hanging down on long pink stems. Sometimes the flower stems are red. Each bell will turn into a nice shiny-dark blueberry that wildlife rightfully enjoys. I’ve watched bears graze in Vaccinium patches, slowly walking along and gulping mouthfuls. They gently harvest most of the blueberries without damaging the shrub. I have tried vaccinium berries myself and decided that they are best left for the bears unless I am starving. Sparkleberry, or farkleberry, (Vaccinium arboreum) is a gorgeous tree and the largest blueberry in North America. Reaching 15 feet tall, its crown spreads as wide as it is tall with luxurious small glossy leaves that blow flimsily in the breeze, contrary to many scrub plants. The sand pine scrub is the extreme dry end of the sparkleberry’s range. It can be found in swamps and anything in-between as well. Like all of the heaths other than tarflower, the flowers are shaped like bells. Thousands of delicately carved alabaster bells adorn every tree. Inside every bell grow deep-red stamens. Its trunk is reddish brown with exfoliating bark. In one spot of my yard, there is a tall sparkleberry set behind a red-blooming fetterbush. What a landscape plan! I wish more homeowners would consider these trees for their yard. Later, like its brother the shiny blueberry, sparkleberry will bear plenty of edible fruit for the birds and adventurous hikers. 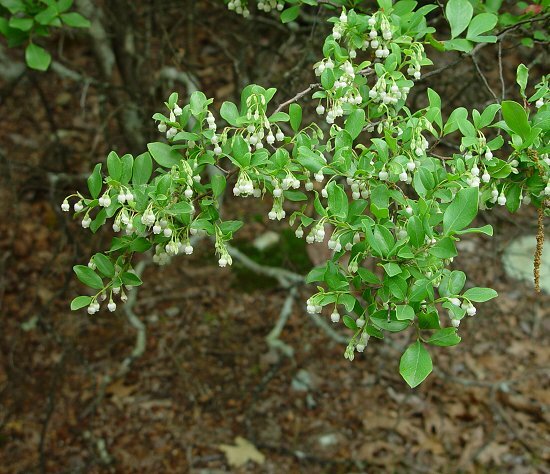 Like the sparkleberry, the deerberry (Vaccinium stamineum) ranges throughout most of eastern North America. Deerberry can be described with almost all of the same attributes as sparkleberry too. Both are beautifully foliated trees. The only real visual difference is that deerberry flowerbells seem to be cut in half. Their stamens extend out below the lip of the bell. The abundant flowers look like shooting stars. Deerberry seems to be more common in the scrub than sparkleberry. Tiny birds hunt in its sweet and pleasant branches. Towhees love the juicy berries. Tarflower, Beforia racemosa, qualifies as the ugliest shrub in the forest for most of the year. Tarflower is a vertical woody shrub with very little branching and sparse, erratic leaf spacing. It holds its spent stems and seedpods long past their glory. Even its name lends little to the imagination. But in late May, the tarflower explodes with unique bright bursts of pink and white flowers that resemble seven-petaled sea creatures or fireworks. For a month, the tarflower is the belle of the forest, attracting onlookers and swarms of long gray-and-black scarab hunter wasps who love its nectar. The bud and petal edges are sticky, like tar, giving the flower its common name. These dramatic displays shoot up high over the surrounding scrub. Soon enough, the flowers will drop, leaving spherical seed pods and returning the tarflower to its lowly, ugly position in life. Even so, I can’t bring myself to trim tarflower wherever it grows in my yard. I want nothing to interfere with its firework display in June. 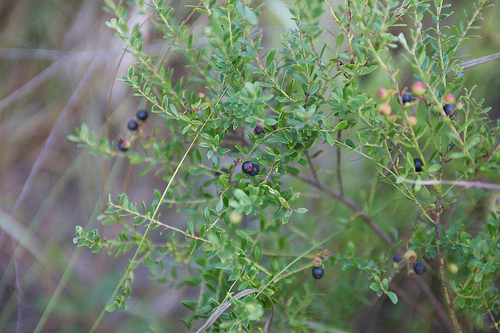 The Florida rosemary (Ceratiola ericoides) is a heath that is unrelated to culinary rosemary. Its leaves are needle-like and circle thickly around the thin branches. When viewed close up, the rosemary looks like a miniature spruce tree. The branches themselves have a very vertical growth habit. Rosemary is brushy but forms attractive mounds. It becomes dominant in the harshest of scrub conditions. The more extreme the scrub, the happier rosemary becomes. Rosemary has come to symbolize the botanical diversity of scrubs. 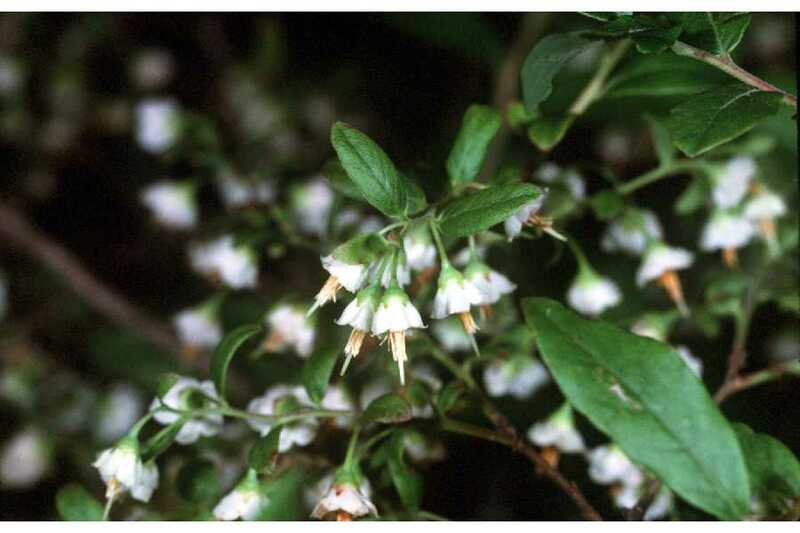 There are countless plants that are endemic to scrub that go unnoticed; thin grasses, miniature bonsai, rare mints. Rosemary is larger than most scrub endemics and more obvious. There are a whole series of specialized, rare insects that depend entirely on rosemary including a moth, a grasshopper, and a spider. In scrubs with richer soils, the rosemary becomes less common, although it is usually present. Scrub rosemary is so dry it always seems like it is ready to burst into flames at any moment. Its seeds lay dormant in the surrounding sand until fire kills the mother. Then, the seeds germinate and respond quickly to the newly opened habitat. Heaths and lyonias are one of the many reasons I have come to love the scrub. Unnoticed by most, their delicate scent and flowers belie their importance to wildlife and early emergent nectaring insects. So I keep quietly waiting for big woodpeckers to land and stuff their feathers with angry ants. I’m beginning to think I will never see it happen. Bits of charcoal arranged and rearranged. Heaths, lyonias. The scrub teaches what it wants me to learn. Please note that the poems and narratives on this site are copyrighted and may not be reproduced without the author's permission. Like your blog. I stumbled upon it when I was trying to I.D. a red Lyonia lucida I happened upon. Great stuff! I'm a harvester ant fan too and had no idea about "anting". Thank you Lori - the red ones really are nice shrubs. And I still haven't personally witnessed anting. I'm sure that birds feel pretty vulnerable when they are doing it, so it would be difficult to see.